Over time, as a result of constant foot traffic and the ravages of the elements, outdoor stairs can start to deteriorate. 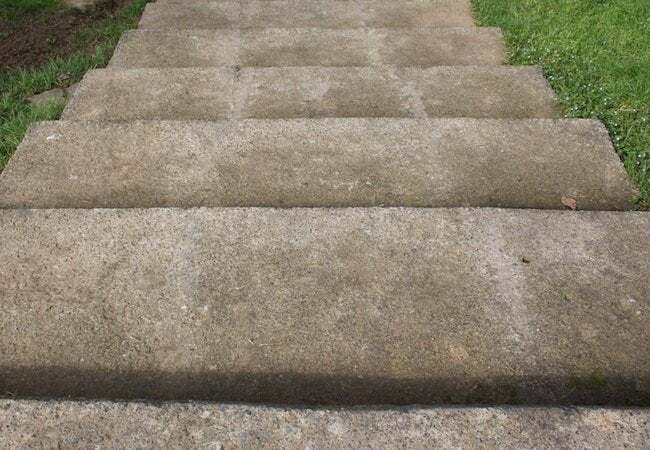 You can reverse damage and keep your stairs looking as good as new with a little maintenance and some innovative, effective products that simplify and speed up concrete repairs. For construction professionals and homeowners alike, concrete offers many appealing qualities, but there may be none greater than its undeniable durability. In many instances, concrete can last for decades without deteriorating or requiring much at all in the way of maintenance. But particularly when it’s used outdoors, where it’s exposed to the elements year-round and beset by extreme temperatures and punishing storms, concrete does slowly but surely weaken. 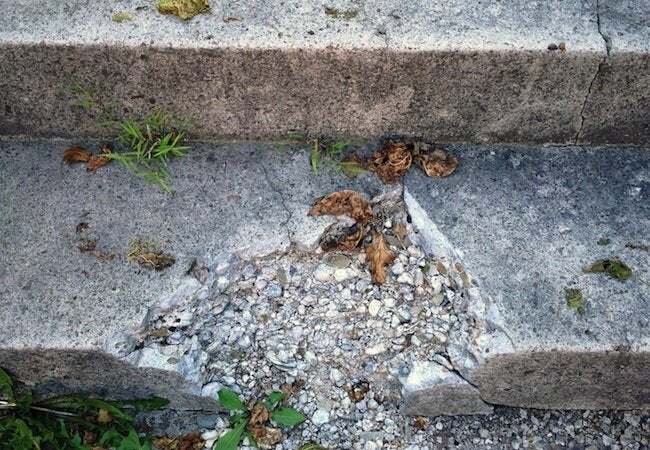 Perhaps no hardscaping feature suffers as much as concrete stairs, which are subject to heavy foot traffic that only serves to hasten deterioration. 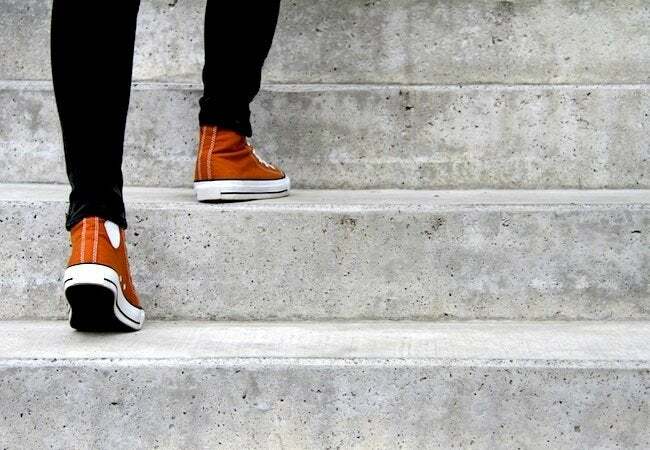 That said, you can repair damage to your concrete stairs, whether it’s the result of gradual wear and tear or a sudden trauma, with a basic course of maintenance. Thanks to advances in manufacturing and a range of innovative products from CTS Cement | Rapid Set, it’s never been quicker or easier to make repairs to concrete. Though the process is pretty straightforward no matter the condition of the concrete, the approach you choose will depend on whether you’re dealing with mere cosmetic flaws or more significant structural issues. In either case, rest assured that you can restore the appearance of your steps while potentially adding years to their lifespan. Read on for the details. Believe it or not, concrete has something in common with a plain white tablecloth—both are capable of getting stained. Of course, there’s no practical harm associated with discoloration, so depending on the location of the stairs in question, you may or may not feel the need to intervene. If the affected stairs are in a highly visible location—leading up to your home’s entrance, for instance—then cosmetic reasons alone may be all the motivation you need to seek a solution. In addition to stains, you should be on the lookout for a range of other minor, superficial issues that commonly plague concrete installations outdoors. Check for signs of weathering, flaking, or crazing (shallow, spiderweb-like cracks). If any such imperfections are compromising the appearance of your stairs, remember this: You can give the concrete a like-new look and a renewed lease on life with a resurfacer like NewCrete from CTS Cement | Rapid Set. You simply spread the product over the existing surface, leaving behind a smooth, blemish-free replacement layer. Best of all, NewCrete works quickly and self-cures. Once you have applied it, there are no additional, tedious steps to complete. Within two to three hours, your transformed stairs will be ready to accept foot traffic again. Although there’s no more straightforward way to revive tired concrete, there are still nuances to working with NewCrete or another resurfacer. For starters, before doing anything else, remember to clean the stairs thoroughly, removing all dirt and debris (including loose concrete). Here, a power washer can be an effective tool and a real time-saver, but an old-fashioned wire brush works too. Next, after preparing the area, move on to preparing your chosen resurfacer. Specific guidelines vary by manufacturer, but with NewCrete, use a drill-mounted paddle mix to combine water and the resurfacer mix in a bucket. Then work the material for a few minutes until it resembles pancake batter. The final step? Dampen the existing concrete stairs, then add the NewCrete, using a trowel to smooth and shape it. Note that a couple of nonstandard trowels may prove handy along the way. When, for instance, you’re trying to achieve a crisp line along the outer edge of a stair tread, your best bet may be a nose trowel. Meanwhile, for the inside edge where a tread meets a riser, opt for a cove trowel. Once you have applied, shaped, and smoothed the NewCrete, there’s nothing more to do. Other products may require a time-intensive water curing process, but NewCrete cures entirely on its own—and with remarkable speed. While you may opt not to make a cosmetic fix—it’s purely elective, after all—structural damage is another matter entirely and should be repaired sooner rather than later. For one thing, structural problems in concrete only get worse, particularly with each passing winter, until the installation deteriorates so badly that it needs to be fully replaced. There’s also the fact that compromised concrete can be a tripping hazard, never more so than on stairs. Certainly, structural repairs are more demanding than cosmetic ones, and badly damaged concrete requires a particularly high level of effort. But even so, solutions like Rapid Set Cement All enable you to shore up failing concrete on your own, and to do so easily and quickly, even without a contractor. Relative to other repair compounds, Cement All stands out for many reasons. For one, Cement All boasts superior adhesion, helping facilitate bonding with the damaged concrete. As well, Cement All—rated three times stronger than most concrete—provides ample, lasting strength. Most of all, though, homeowners appreciate how rapidly the product sets and cures. Indeed, if you make your repair with Cement All, you can go back to regular use of the stairs in just an hour. Whether the damage involves the horizontal or vertical surfaces of the steps, start by eliminating any loose material that could interfere with proper bonding. As you go, look for deep cracks and take the time to chisel their edges smooth (and, of course, brush away any debris that results). Once you have made the steps as clean as possible, roughen and dampen the surface or surfaces you plan to address. Then, to prepare the Cement All, combine the mix with the recommended quantity of water. Continue working the mixture, either manually or with a drill-mounted paddle mixer, until it has achieved a peanut butter-like consistency. Ready? Trowel Cement All onto each damaged area, taking special care to get it into any cracks or holes. Pack the cement to the desired level, but depending on the nature of the repair, note that it may be necessary to use a wooden form to help the compound retain the desired shape. Given stairs’ blocky character, a form can typically be made from scrap wood nailed into an L shape and then positioned firmly against the riser, with its top edge level with the surface of the stair tread. To finish, smooth the Cement All with either a trowel or float, and then, once the surface has lost its moist sheen, proceed to water cure. That’s it! Bear in mind that you can always use Cement All and NewCrete in tandem, as a tag-team remedy for the full spectrum of issues that threaten to destroy any concrete installation. This powerful pair will leave your concrete stairs not only structurally sound but looking like new. While Cement All fortifies, NewCrete beautifies—and because both products set and cure so rapidly, it’s possible to breeze through a job in one day, or even in one afternoon. Speed matters: If the stairs serve as the main access to the house or lie along a frequently traveled part of the property, a long and drawn-out repair process can be a real nuisance. As well, when you’re dealing with a material that lasts as long as concrete does, over the years you’re bound to encounter more than one occasion for maintenance. After all, foot traffic and the passage of time both take their toll. You’ll want every repair job to go as quickly and smoothly as possible. Fortunately, so long as you rely on innovative, rapid-setting repair products from CTS Cement | Rapid Set, you’ll be able to maintain the longevity and looks of your concrete steps while still leaving plenty of time for all your other to-do’s—or for that matter, some well-deserved rest and relaxation. This article has been brought to you by CTS Cement | Rapid Set. Its facts and opinions are those of BobVila.com.